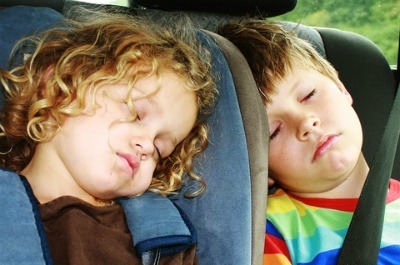 These car games depend on whether you are sitting in the backseat with the kids or driving. The answer to that question will determine with what car games you're able to engage the children. Good games= trivia, magnets, books, coloring, guessing games, games that involve looking out the window. Bad games= tiny pieces, anything involving shouting out the answer, "punch-bug" (or whatever they call it in your area, where you punch your neighbor if a particular car appears on the highway). 1. The Alphabet Game This is an extremely versatile game. The idea is to choose a category (this may have nothing to do with looking out the window, or it could). Decide who will lead off, and they must say a word that begins with "a" in the category you've chosen. The next person finds a "b" word that matches the category, and so on. You can make this simple for younger ones, by choosing food for the category, or more difficult for older children, by choosing famous people, books of the Bible, or characters from the Bible, Disney characters, etc. 2. License Plate Game This works best for long trips or big cities, but you may be surprised at the number of "out-of-towners" you'll see on the road. This is a great car game because it involves the entire car and doesn't create competition between seatmates. The object is simply to find as many different states represented by license plates as you can. Have someone write down the different states and see how many you can get before your next stop. (Or follow the link and purchase an actual board for it). Depending on how long you drive, you can keep up the game, or stop for a while and pick it back up later. 3. Brain Teasers These can be the "8 numbers in a square with one space for sliding" puzzles, or the Brain Quest flash cards, or anything that challenges children's minds. For the sliding numbers puzzle, ask one child to mess up the puzzle and pass it to the next child to try to figure out. This works best with children who are old enough to know how to figure them out in the first place, and younger children may become frustrated, so keep that in mind. Easily print off your own "worksheets," and try to make sure they'll be fun for the kids. (If it looks too much like school work they may not be interested). 4. The Quiet Game Believe it or not, this will entertain the kids and may give you some peace and quiet. It's a pretty simple car game that works especially well in a car, because there are fewer distractions. You simply challenge the children to silence, and the first child who talks is out. They'll want to know all the rules: can we cough? Can we sneeze? And once you start, someone will laugh, the someone will talk, then you'll have to start over. You can even reward the winner with a penny or quarter. 5. Story Telling Yes, story telling. With a twist: Whoever's telling the story uses objects he or she sees looking out the window. The stories will be ridiculous and fun, and the children will have a blast. Lots of times it's the simple things that keep children entertained. "Once upon a time a cow was walking along I-85, and he ran into a gas station! He asked the manager for some milk..."